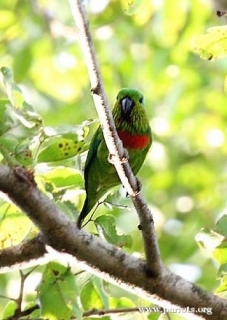 The Salvadori's Fig Parrot was the last fig parrot to be discovered, in 1880. Male-golden yellow longish feathers of cheeks and ear coverts; blue stripe behind eye; red/orange wide band across chest with pale blue patch on each side of breast which varies from bird to bird; orange/red edging on inner wing coverts; wide underwing stripes cream/yellow. Bill grey/black. Eye red. Female-wide pale blue band across breast with orange/rust markings on each side of breast which varies from bird to bird; yellow/green longish thin feathers on cheeks and ear coverts. As in adult female but in general duller in colour; pale blue chest band faint or invisible. Eye red/brown. Calls while flying or perching include a stronger call that is a single short note, broken two or three times in a staccato trilling song. Weaker call is high-pitched and squeaky, but not shrill or staccato. Soaked dry figs (soak in filtered water for a few hours), two or more per bird daily; one drop of Konakion (Roche) or other vitamin K additive; fruits such as: apple, pear, orange, kiwi, guava, papaya, cactus fruits, forming at least 50 percent of diet; soaked sultanas; berries such as: elder, mountain ash, blueberries (unsprayed), pyracantha; spray millet; small seed mix such as: canary, oats, safflower and a little hemp; limited sunflower seed; cooked beans and pulses; rearing food consisting of: hard boiled egg, wholegrain bread and carrot, all ground to crumbly consistency; breeding diet: large quantities of clean mealworms during first 3 weeks of life, commercial insectivorous food. Withhold seed for first 3 weeks of chicks' lives. Vigorous chewers so provide heat-sterilized pine cones, unsprayed flowering, fir, pine, elder or willow branches; wooden block or vegetable tanned leather toys; swings, ladders and ropes (non-sisal). Provide overhead misters or shallow water bowls for bathing. L-shaped nest box with 5" x 10" (12cm x 25cm) base, 5" (12cm) high. Large numbers have been trapped for the wild bird trade. Human encroachment with the resultant loss of habitat and logging for timber and agriculture have also been threats. A dam project which was shelved in the 1990s was proposed for the Mamberamo River, and would further jeopardize the species. There are concerns by environmental groups that it could be resurrected sometime in the future. NW New Guinea, from Humboldt Bay and Cyclops Mountains to eastern shores of Geelvink Bay, Irian Jaya. Found up to 700m (2296 ft). Seen in forest, along forest edge, in partly cleared areas and near towns and villages. Feeds on Ficus figs, fruit, nectar and flowers. Gregarious; mixing with other species of birds. Birds hang upside down to feed, and make brief sorties above the forest canopy. Most frequently seen in pairs or small groups; they also nest in colonies.